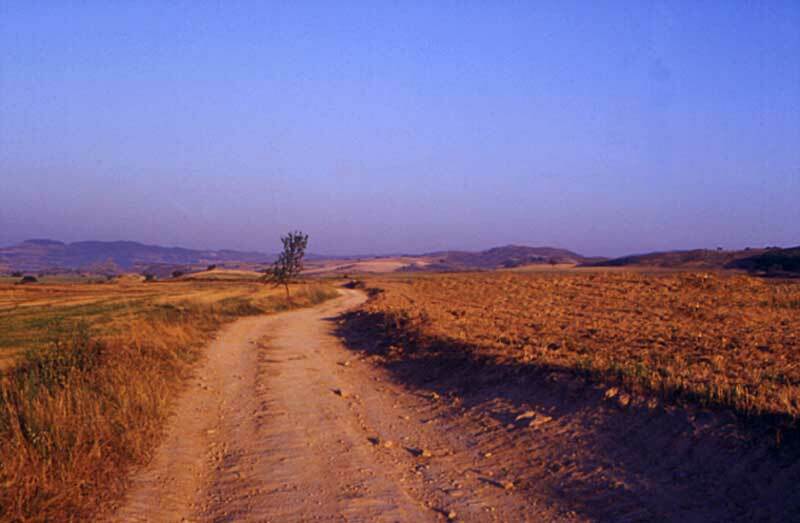 The development of the Camino was a major enterprise supported by influential and wealthy interests. The Spanish pilgrimage road to Santiago de Compostela is a journey of almost seven hundred kilometres crossing two formidable mountain ranges, the Pyrenees and the mountains of Leon as well as the flat expanse of the Castilian plain, so baking hot in the summer months. In the tenth and early eleventh centuries this was a barren, empty landscape, forming the frontier of Christian and Moorish Spain. Over time, the pilgrimage road across it was to become the spine of the medieval Christian empire. In the late eleventh and early twelfth centuries towns and cities on the road began to be transformed. Within a relatively short period of time monumental structures were erected as builders and sculptors traveled back and forth along the pilgrimage artery, creating on a prodigious scale, a series of homogeneous structures which constitute the great pilgrimage road. The transept facades of the cathedral of Compostela combined the work of sculptors from Toulouse, Moissac, Conques, Jaca, Fromista and Loarre. Some returned to work at Leon and Pamplona. There was a potency in the very idea of this public road which drew on a range of interests and motives. From the time when Sancho el Mayor, ruler of Navarre, diverted the pilgrimage road from the coast towards Pamplona and Najera in the early part of the eleventh century, the route took in all the royal cities between the Pyrenees and the Atlantic coast; Jaca, Najera, Burgos, Leon as well as the royal pantheons at San Juan de la Pena, San Salvador de Leyre, Santa Maria de Najera, Las Huelgas de Burgos, Sahagun and San Isidoro de Leon. It’s building programme was by-product of the Reconquista, funded largely by the ransom and extortion of the Moorish principalities and an expression of the power of the dynasty Sancho bequeathed. It facilitated the introduction of Catholic liturgy into the Spanish peninsula, for so long cut off from the rest of Europe. It was the vital commercial artery for encouraging French merchants to revive and repopulate an economically moribund area which had remained an empty no man’s land in the centuries since the Arab invasion. It is this phenomenon which is recorded almost contemporaneously in the twelfth century manuscript book five of the Jacobus or Codex Calixtinus, known as The Pilgrim’s Guide. It is a remarkable fact that the engine which fuelled this vast enterprise was the veneration of saintly relics. ‘The Joining of Heaven and Earth’ is a powerful, interesting blog that is taking the reader (its followers, if you will) to Santiago de Compostela, showcasing the magnificent Romanesque architecture to be found along the way. This post introduces us to the road in Spain with a fascinating video about San Isidoro de Leon which discusses the relationship between the architecture and the Reconquista. Enter the world of the architecture of the central Middle Ages and be inspired, dear readers!